In the fast-paced world of motor racing, you are rarely far away from a scandal, rumour or crisis. How to deal swiftly and effectively with emerging issues or incidents exposes weaknesses in any communications team. The FIA World Endurance Championship, which has taken a bit of a battering in recent weeks, showed how to weather a storm with its expert handling of the 6 Hours of Fuji. Heavy rain and imposing fog made for a disjointed and unpredictable six-hour race. At times, the fog-filled circuit was more akin to the 1980 John Carpenter horror movie, yet the WEC ensured its communications were clear, even if the skies were not. Series boss Gerard Neveu and Race Director Eduardo Freitas put on a master class in communications and race management, which put audiences at the track and those watching around the world at the very heart of their decision making processes. With track action punctuated by a series of safety car periods, slow zones and occasional red flags, one of which would prove race ending, fans were involved at every stage. There were logical explanations given and regular updates on the rapidly changing weather conditions. Through clear and regular communication to its audiences, WEC made it clear that every effort was being made to keep the show going with driver safety as top priority. The rules of effective crisis management were followed: be honest, be accountable, be visible, be human and take action. Neveu’s presence in front of the camera did all of those things. His delivery was professional and collected. He showed that WEC was in control, talking fans through the process, and giving greater insight into the complexity of the situation. A final attempt to get racing with 15 minutes to go was scuppered by more fog, leaving home favourites Toyota with a popular victory. 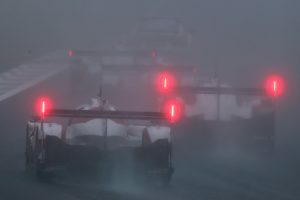 There may have been just 113 laps of racing, many of which were spent at reduced speed, but WEC’s decisive actions and clear communication prevented the race from descending into a foggy horror show. This blog has been inspired by Graham Goodwin’s post on DailySportsCar.com. SQN has 15 years of experience developing powerful communications programmes for world-leading organisations, including crisis and reputation management. Contact us hello@sqn.agency for more information.